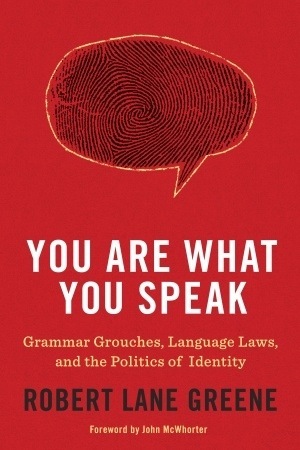 One of the reviews of this book faults Greene for writing about linguistics without being a linguist. I don’t find the same fault in the pages here. Certainly, this has the density one would expect from an Economist writer, but don’t let that fool you. As an English major and English teacher who has been thinking about these things for some time, the initial introduction to prescriptivism and descriptivism did much to act as a refresher for the topics and lay the foundation of the different global perspectives of the book. From a historical understanding of the resurrection of Hebrew to the formation of modern Turkish (an subsequent distance from pre-1930 Turkish texts), I’m walking away from this book with much richer and deeper understanding of language and it’s formation around the world. Perhaps most helpful for me was Greene’s clear love of language. If there were any impediment created by his lack of training as a linguist, his love of language makes up for it handily. Reading about language from the perspective of one who is so clearly curious and in love with language shapes the book as a tool for infectious love of language. If you’re curious about language, read this. If you’re passionate about language, read this. If you are hungry for a appropriately-dense text acting as a primer to understanding linguistics, read this. It’s not a book for everyone, but it’s definitely a book for those who love and are fascinated by language. Graduate school has just as much reading as undergrad and then some. Think of it as all the reading you were pretending to do for your bachelor’s, plus 50%. Add to that the fact I was picking up ancilary reading left and right, and I’m surprised my eyes didn’t start bleeding by the end of the semester as some sort of academic stigmata. Secretly, each time I added a book to the When I Get to Read What I Choose pile, I also remembered a secret worry – What if I didn’t want to read anymore? For the first few weeks of break, it seemed true. I caught up on and re-watched favorite trash television before I considered picking up a book. I was worried this would be the default for my trip home. I imagine all addicts feel that way during detox. Then, a few days ago, I picked up Neil Gaiman’s Neverwhere. My sister Rachel brought it home for me from school on a friend’s recommendation when the friend learned of my appreciation for Doctor Who. After I picked it up, I couldn’t put it down. Yesterday, I started and finished Jeanne Darst’s Fiction Ruined My Family. I’d picked it up on a Barnes & Noble splurge fueled by the gift cards due as patronage for any family of an English major. Today is a writing day. Otherwise, I’d be delving deeply into Catching Fire (the second volume of Suzanne Collins’s Hunger Games series) with World War Z fast on its heels. It turns out, yes, I am still a reader. I am still one who finds comfort in the words of others after they’ve been knitted together from a single narrative strand to wrap myself in, and take comfort in worlds just out of focus from my own. I’m on page 111 now, but it was much earlier, when I read the passage below, that I knew it was literary love. There are four simple ways for the observant to tell Mr. Croup and Mr. Vandemar apart: first, Mr. Vandemar is two and a half heads taller than Mr. Croup; second, Mr. Croup has eyes of faded china blue, while Mr. Vandemar’s eyes are brown; third, while Mr. Vandemar fashioned the rings he wears on his right hang out of the skulls of four ravens, Mr. Croup has no obvious jewelry; fourth, Mr. Croup likes words, while Mr. Vandemar is always hungry. Also, they look nothing at all alike. Just because I’m not in classes at the moment doesn’t mean I’m not reading. It does mean I’m not reading anything that anyone has assigned to me. It also means I’m sneaking some fiction into my brain. Tomorrow, I’ll pick up Orson Scott Card’s Ender’s Game. Some of my favorite students gushed over the book, but I never took the time to read it while I was in the classroom. Somehow, picking it up without the title of “Teacher” attached to my actions makes the reading seem more pure. I’m not reading it to teach in the next few months. No unit or lesson plans will rely on what I get from the experience. I’m reading it to be entertained. As I anticipate delving into Card’s imagined dystopia tomorrow, I’ve started to think about the importance of asking students to identify reader’s purpose. If a student is reading a non-fiction text in class, the answer to the question should be, “Because I’m curious,” or “Because it’s interesting.” Some off shoot thereof makes the most sense. That shifts the experience considerably. I’m looking forward to losing myself in the imagination of tomorrow’s reading, to meeting new characters and trying to figure out how pieces of the narrative puzzle fit together. Most importantly, I’ll be shifting my purpose from word to word, chapter to chapter. The journey through the book will inform what I want out of it and what I expect. Were I reading for someone else because the book had been assigned me, the journey would be emptier. I’d be reading to run someone else’s literary errands, hoping to keep the change when all was said and done. A balanced reading diet is important. Compelling others to read what they are told is forcing them to eat their vegetables. It’s a great way to get people to hate their vegetables. The smarter the journalists are, the better off society is. [For] to a degree, people read the press to inform themselves-and the better the teacher, the better the student body. I’ve mentioned longform.org, a site my friend Max and his friend Aaron started April 2010. From an education standpoint, though they didn’t start the site for education, longform is perfect for schools wondering how they can find and incorporate extended, high-interest quality non-fiction reading into their curricula. But this post isn’t about the classroom. Longform has curated it’s Top 10 (or 20) best pieces of long-form journalism of 2011. With the list’s publication, my reading list for the next few weeks has been set. I also subscribe to the site’s spin-off, sendmeastory.com, which does what the name implies each weekend. Two weeks ago, I got this story from Esquire about Michael May a man who had been blind his entire life and his struggle over whether to undergo surgery that could give him sight. That’s not an infrequent occurrence as I read stories from longform. The site does the work of collecting the most interesting and impactful stories being told and putting them in one place. What’s more, they’ve fully integrated Readability, Instapaper, Read It Later and Kindle queueing so I’m not tied to the computer screen when I want to read. While I still think longform is the unintentional answer to the wants of many a curriculum designer, I know it’s the intentional answer to the wants of anyone in search of a well-crafted piece of journalism. – Luis Moll et al. Moll, Luis et al. (Spring 1992). “Funds of Knowledge for Teaching: Using a Qualitative Approach to Connect Homes and Classrooms,” in Theory Into Practice, XXXI(2), 132-141. Laura asked last night at dinner, “What’s is a book that has impacted you?” She was looking for a book that shaped who we are. She was looking for a book that we needed to read for us to have continued on the course to who we are. I loved it even more when Christian re-imagined it. The discussion deck was stacked as three of those around the table were English teachers. The list, as much of it as I was able to copy down, is below. It’s given me much to add to the Kindle for the summer. And I will be adding as many of these books as I can. I’m not adding them because the plots sounded interesting (though they did). I’m certainly not at a loss for additions to my reading list. I’m adding these books to the to-read list because they were the answer to a question of what thoughts and ideas people I find interesting and thoughtful consider to be formative and critical to their foundations of self. I like understanding (or at least working toward understanding) how people come to their ideas and beliefs. Packing to move, I’ve been sorting through the books on my shelves, the books others bought for me because they thought they were the right fit. Many of them have been a good fit. Many of them have brought me good stories. Still, I am mindful as I read these books that I want to like them because I want those who know me to be right. The question of what you would make sure you read works better for me. Another person’s assumption of what I’ll like is not nearly as interesting to me as learning what they’ve liked. I read those books with a different eye. I read those books to get to know the person and to get to know the book. So, here’s the list. Maybe some of these titles will make their way onto your summer reading list. If you’ve got the time, share the book that you would make sure you read. I’ll say it again. What book would you make sure you read?